Don’t’ you feel curious when seeing the Little One is adept at standing alone but not yet making his/her first step. Walking is the stage of development of the Little One that will change his/her life. By walking, he/she is more free to explore his/her environment. Most of the Little One can walk at the age of one year, but the normal time span of the Little One to start walking is at the age of 9-18 months. Tummy time is the time that the Little One is using in prone position while training his/her hands and feet to reach an object. This session is important for to increase the strength of the Little One’s neck and back muscles. The muscle is useful as a foundation for his/her body when walking. Once the Little One can sit alone without support, invite him/her to play toys throw-catch. This game will train the balance of his/her body and train the coordination between the body and hands. Avoid carrying the Little One too much. Let him/her play a lot on the floor that is covered by a carpet or a mattress. When carried, he/she will not be able to train the strength of the muscles of his/her body. He/she will not be trained to support himself/herself. Most of the Little Ones experience crawling stages. This stage is a very exciting developmental period for him/her because he/she can move wherever he/she likes. As long as he/she explores things that are not harmful, let the Little One do it. Reaching a table leg or holding a chair can be an exercise for him/her to stand on his/her own. This is also an early sign that indicates that he/she is ready to walk. When the Little One starts to try to stand or walk, it is best to use a table, chair, or other tool like a toy trolley as a means of supporting his/her body. The exercises to walk should be done by pushing according to normal posture. Avoid the use of baby walkers because aside of the fact that the tool is not effective in training the Little One to walk, the number of accidents as a result of the use of baby walker is high enough. This is why the American Academy of Pediatrics issued a ban on the use of such aids several years ago. The use of footwear can hamper the Little One to train balance and taste sensation in his/her legs. The American Academy of Pediatrics recommends using lightweight footwear, made of a cool material, and has a rubber sole to prevent slippage when traveling and in a need to use a footwear. In addition to the above exercises, the Little One needs nutrients that will help him/her maintain bone as well as teeth density. To meet these needs, Mommy can provide them with nutrients that contain calcium and vitamin D.
Stimulation of walking for the Little One can be done by playing. The Little One generally loves the plane. Mommy can make cardboard airplanes made of tissue rolls and duplex cartons. Then, after completion, fly the plane. The Little One will be curious and move to reach it. Mommy can find inspiration of creative ideas of other playing activities to stimulate the Little One's motor skills development Morinaga Play Plan. Create a plan to play so the Little is not bored with the same activity-so that all of his/her intelligence potential can be honed maximally. Now Mommy already knows how to train the Little One to walk, easily and correctly. Good luck in practicing! Breast milk contains nutrients and immune substances required by the Little One. In order for the Little One to be able to fight germs and be protected from various sources of illness, they require a good immune system. Apparently, sources for immunity have already been prepared since the Little One is still in the womb of the mother. The word ‘spa’ is perhaps already familiar to parents. 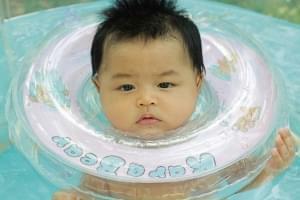 In recent years, baby spa services have begun to emerge, particularly in urban communities.